Manufacturing town of western Hungary. It was the scene of two martyrdoms of Jews: the first, in 1494, when fourteen men and two women gave up their innocent lives, as a manuscript dirge of the Cracow community recounts; the second, when the revenge and hatred of the citizens of Tyrnau were aroused against the Jews at the time that the inroads of the Turks terrified Hungary. The burning of the Jews at Pösing in 1529 was followed by similar acts in the communities near Tyrnau. Still, the latter city did not succeed until ten years later in getting rid of the Jews within its limits. In 1536 a three-year-old boy of Tyrnau was found dead, whereupon the citizens, who were intriguing against the Jews, accused them of having murdered the child. King Ferdinand I. tried in vain to pacify the angry citizens: the Jews that were suspected were executed; and on the request of the city authorities Ferdinand banished (Feb. 19, 1539) forever the remaining ones (this decree was confirmed by Leopold I. in 1686). Jews were strictly forbidden to set foot within the city or the territory belonging to it; and those who even unwittingly violated the order were severely punished. In 1717, when a subject of Count Kaunitz was punished, the count, wishing to put an end once for all to these proceedings of the city, did his utmost to secure the annulment of the charter of Ferdinand I.; but he succeeded only so far as to bring about the execution of an agreement between the city of Tyrnau and the Jews, the latter being represented by Simeon Michel, an ancestor of the German poet Heinrich Heine. 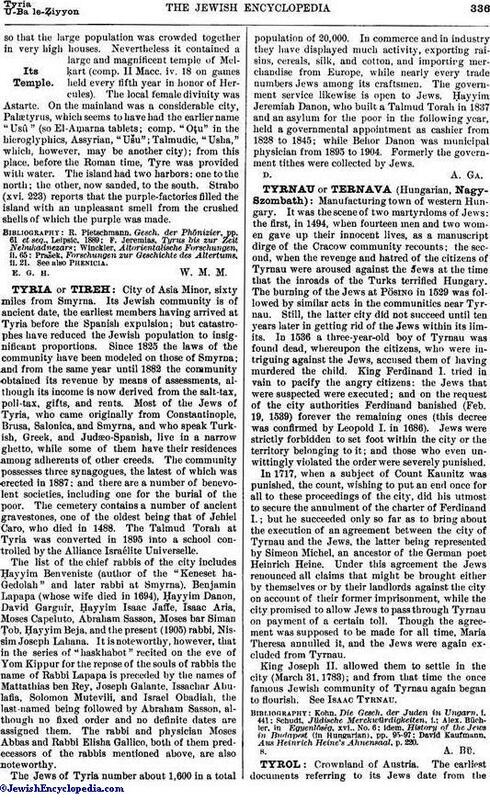 Under this agreement the Jews renounced all claims that might be brought either by themselves or by their landlords against the city on account of their former imprisonment, while the city promised to allow Jews to pass through Tyrnau on payment of a certain toll. Though the agreement was supposed to be made for all time, Maria Theresa annulled it, and the Jews were again excluded from Tyrnau. King Joseph II. allowed them to settle in the city (March 31, 1783); and from that time the once famous Jewish community of Tyrnau again began to flourish. See Isaac Tyrnau. David Kaufmann, Aus Heinrich Heine's Ahnensaal, p. 220.